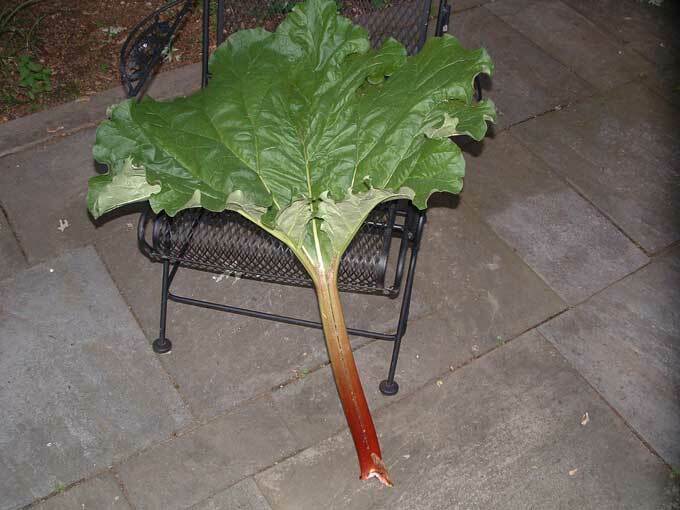 Rhubarb is an interesting perennial vegetable that offers an ornamental appeal with its bright red stalks and huge elephant ear sized leaves. While it doesn’t win many popularity contests when it comes to eating or preparing this vegetable, I always grow a plant or two in the garden. 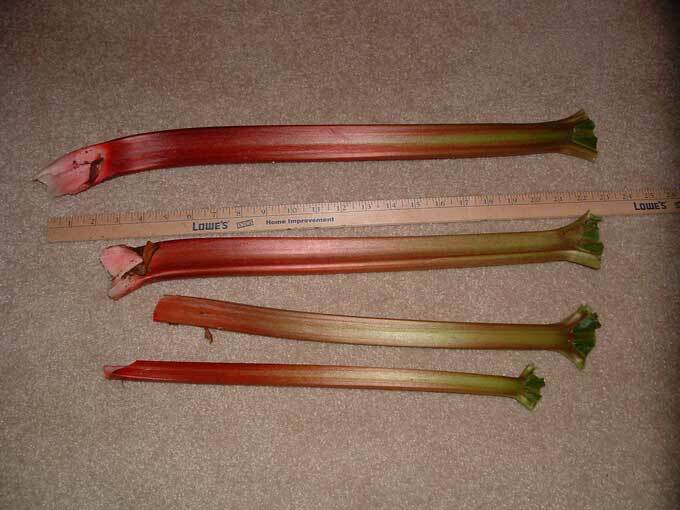 I frequently receive comments from gardeners experiencing difficulty growing rhubarb in their vegetable gardens. I don’t do anything special and my rhubarb flourishes with very little attention so I would guess that any trouble raising this perennial vegetable has to do with the soil quality and preparation prior to planting. 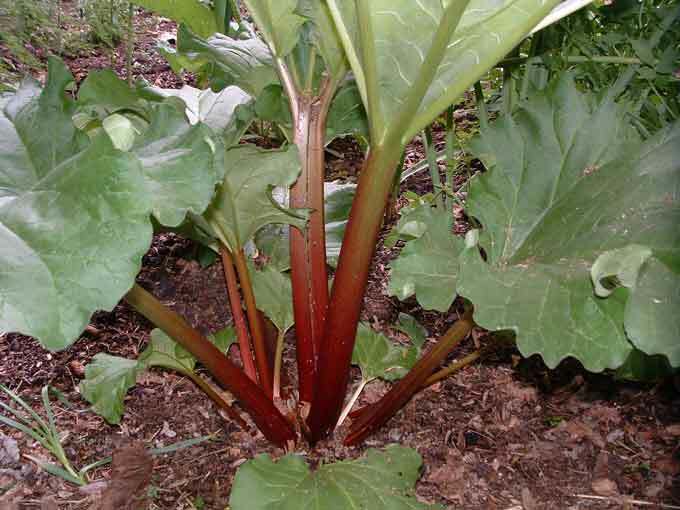 Rhubarb enjoys a rich, fertile soil with good drainage and high levels of organic matter. It will also benefit from annual applications or side dressings of compost and well aged manures. If you’re growing rhubarb in a poor quality soil then begin by enriching the area where you intend to plant the rhubarb plants or root divisions. Dig a hole that is three feet deep and about three square feet wide. Fill the area with a rich mixture of good quality topsoil, compost, and aged manures. Your rhubarb plants or root divisions can then be planted right in the center of this enriched growing area. Start rhubarb from root cuttings or obtain plants in the spring from your local greenhouse or garden center. It’s best to plant them in a perennial herb bed with other perennial vegetables like asparagus and sea kale. Rhubarb can also be planted in the vegetable garden at the end of a raised bed where it will not be disturbed. 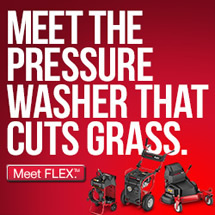 Just be sure to give it plenty of room as the plants can cover an area of four or five square feet. New rhubarb plants shouldn’t be harvested at all during the first year and only sparingly during the second growing season. The leaves are not edible; it’s the thick stalks that are included in a variety of recipes and desserts. Harvest the stalks by carefully twisting them off from the base of the plant. Limit your harvest to a few stalks at a time to ensure that the plant has enough leaves left to build reserves to the root system. After six or seven years of growth the roots may need to be divided in order to maintain good productivity. Rhubarb plants will produce either red or green stalks, with the red varieties being much more ornamental in the garden. Popular rhubarb varieties include: Canada Red (one of my favorites), Ruby, Victoria, Mammoth Red, Prince Albert, Macdonald, Crimson Cherry, Sutton’s, and Riverside Giant. While rhubarb is classified as a vegetable most of its uses are as an ingredient for making desserts. It provides a very tart flavor that blends well with sweeter fruits and ingredients. Rhubarb stalks are commonly included in recipes for pies, cakes, sauces, jams, cobblers, tarts, and breads. With just a little care in enriching and maintaining a fertile soil, rhubarb will provide you with years of trouble free growth and large, ornamental plants that will decorate the garden’s beds even if you never harvest a single stalk for use in the kitchen. I don’t know how I got here but I love your site. It is very inspiring! 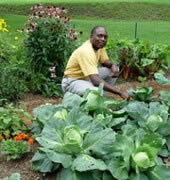 Makes me want to really get into organic gardening with no pesticides! Thank you for sharing your insights. Thanks for this. I swear I’m going to get rhubarb going one of these years! The lady at the grocery store where I bought it last said they used to mow it down with the lawn mower, it was so prolific in the midwest where she used to live. Aaack! What a waste! My brothers rhubarb in Rusk County, Wisconson starts growing then turns to seed real fast. He does not get to enjoy eating any of it. Can you tell me the reason why? I would really appreciate it very much. Thank you Rebecca Robinson. Rebecca, I’m not sure what you mean by the Rhubarb “turning to seed real fast” I’ve seen rhubarb plants develop a very small almost unnoticable seed stalk which is easily removed and doesn’t really affect the quality or flavor of the Rhubarb harvest. When I grew non-ornamental rhubarb in New Brunswick, I had two 30 foot rows of the red variety, which we called strawberry rhubarb. You might wonder what in the world could you do with that much rhurbarb. It turns out that it makes the most incredible wine-a pale pink dry chablis. Since I don’t drink anymore, I have long since lost the recipe which I found at the library in an English winemaking book. 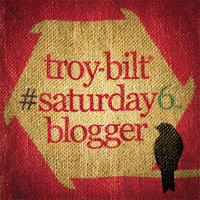 For any winemakers out there, it is a treat not to be missed. Marilyn, I wonder if your impostor rhubarb might actually be cockleburrs. They are really hard to get rid of. I recommend digging them out. At the very least don’t let them go to seed. I would really like to know if what I think is rhubarb is actually a weed, as my friends think. The plant looks like your website picture but at the top there is a growth, flower? /seeds?? I have pulled it out last year as a ‘weed’, but this year it’s back & I think it is rhubarb — but not sure – Would love to harvest it if it is the real thing! Hi Elsie, does the growth that you mentioned look like the last photo in this article about Vegetable Seed Stalks? Rhubarb is pretty distinctive looking, but always get a positive ID before eating any plant that you are unsure of. The photo you asked me to check does not look the same. I just went to have a better look at the plant, now about 4’high, which is just getting taller by sprouting more leaves. What I thought was going to open and flower is just more leaves. Also although the stems at the bottom are red at the source, the whole stalk has a fibre’y surface, not smooth like rhubarb – I think I’m looking at what articles suggest might be a ‘cockleburr’ – best to pull it out 🙁 will go to purchase a plant, then I will have the right thing for sure. Thank you for your assistance. Much appreciated.